Full bodied, soft, long finishing Chianti. In 2002 no Riserva has been made; all the good ripe grapes went into this Chianti. Some Merlot and Cabernet have been added to add to the body of this wine. 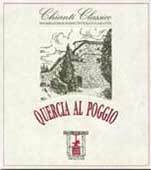 A modern blend for a classic Chianti winemaker that works only with big oak vats and organically in the vineyard.